The value add of Google Analytics. Will the real obu please stand up, part 2. 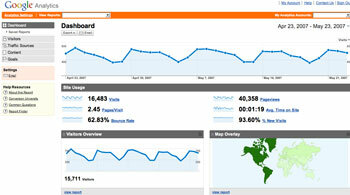 Google Analytics is a pretty slick package offered by the big G that is free to use. It gives you tombs of website visitor and traffic data to poor over. The obvious benefit is to track visits and visitor behavior on your website. But deep into a long session of analyzing data I stumbled upon an additional easter egg not advertised in the brochure. These highlighted pages DO NOT EXIST on our website. So this then begs the question, why is our Google Analytics report showing pageviews of pages that are not present on the website. It seems that in the act of stealing our website, a few wiseguys neglected to remove the tracking code. This is a real bad rip off of our old site. This UofA student is probably upset with us because he was pulling our CSS file which we moved.. so all his layout went bye bye. So finally here is one more way to spot interesting visits in your Google Analytics. Click Content > Content by Title, if you see any page titles that do not look like yours, grab them and then do this search in Google: allintitle:<page title> and the first or second result it probably the culprit. Here is the real question, Does this hurt our website? We know that Google tracks all this stuff for their own reasons. They give Analytics away so they get behind the scenes access to your website, and mine that data for all sorts of Google projects. So if they are tracking data on obuweb.com that does not match the REAL obuweb.com, are we getting slammed? This entry was posted in Articles, Oblog, Web of Interest on May 24, 2007 by Joshua Strebel.